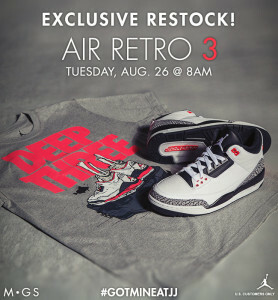 Jimmy Jazz is restocking the Air Jordan Retro 3 Infrared at 8 AM EDT on Tuesday 8/26. Luckily for sneakerheads this doesn’t interfere with the release of the Kobe 9 EXT Snakeskin and Retro 1 KO Sport Blue at noon. Use this link and start refreshing at 7:57 for your best chance at copping a pair tomorrow.